Way back, many, many months ago (like 4) when I decided to skill into logistics I had this dream that I would start to print ISK in incursions and become fabulously wealth. Then they smacked incursions with the nerf bat. After incursions rolled around with a bloody nose, screaming about the unnecessary assault while others laughed, they reversed some of the nerfs. The side effect is that some people are playing them again and making ISK. Now I have all of these incredible Logistic(V) skills. Time to try something new. I've never engaged in such a complex PvE activity. I stopped missioning on my own at the tutorial missions. All of my missioning has mostly been social or to try to prove to myself that I can do basic things. I've never made ISK directly from missions for isk, it's always been about the salvage, or the complexes or the exploration sites and the ISK came from the loot. I went to one friend who runs high sec incursions to ask about them. He said "Incursion Scimitar required to be cap stable and having a tracking link is popular. Standard tank requirements apply. Logistics get picked up ridiculously fast if they're reasonably well fitted." "Yes." I was then given this link to this graph from http://incursions.nexsoft.de/images/sig-ehp-graph.png. I blinked at it. I've skipped something that makes sense to other people along the way. Even now, when I run missions it's with a PvP ship and a logistic ship. The solution was easy. I waited until ren logged on and asked him for a scimitar fit. He used to run incursions for ISK and we had a discussion about their usefulness for learning logistic skills in fleets. Ren gave me two fits. One had shiny bling on it. I screamed and writhed for a bit at the expense. He laughed at me and told me that it wasn't that expensive (around 100 mil in shiny pieces) but he had a nonshiny fit for me as well. That was a lot better. I'm still loathe to strap super expensive things onto my ships. I was directed to join the channel "The Valhalla Project" which had a link to a lovely walkthrough. 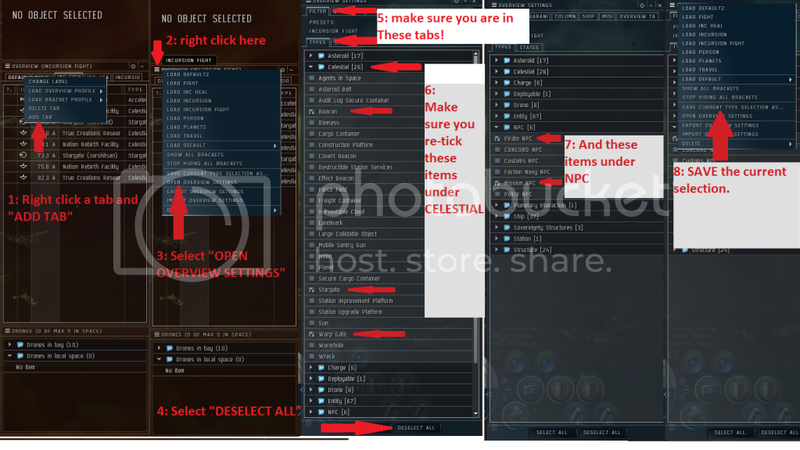 With an overview settings help. My normal overview settings seem to work fine. Again, PvP differences? The channel was fairly chatty. They had a MOTD that listed where the incursion was and where to stage. Everything seemed a bit complex. My friend had told me to join the teamspeak channel and wait. Everyone in the rooms seemed to know the general ebb and flow. Finding basic information was not easy. I had to filter a lot. I undocked and stared at my HUD. I felt dirty and strange. I had no propulsion module. The nearest incursion system looked to be about 15 jumps away. I headed towards where it seemed that I needed to go. Things were busy when I arrived but I wasn't able to find a fleet. Plus I was shy and felt weird. Then it was time to go out for dinner. Ren logged on and we chatted. A bit before I left he found a pick up group and got started. I told him that I would check in with him later and see how it went.